Go Straw-free this Earth Day! Summer is just around the corner, the perfect time for sipping ice-cold beverages from your favorite coffee shop, café or restaurant. To encourage Hampton Roads restaurants to serve those refreshing drinks in a more sustainable fashion, we are excited to partner with Keep It Beachy Clean on a “Straw-free Earth Day” event on April 22. The one-day campaign will raise awareness about the environmental effects of single-use plastic straws, ranked among the top 10 most littered items by The Ocean Conservancy. Plastic straws are made of materials designed to last decades while typically being used for 30 minutes or less. The straws then become garbage – or worse, litter. Littered straws are especially harmful for the environment because they can break up into smaller pieces over time (called microplastics) and are commonly eaten by sea turtles, birds and other marine life that mistake them for food. 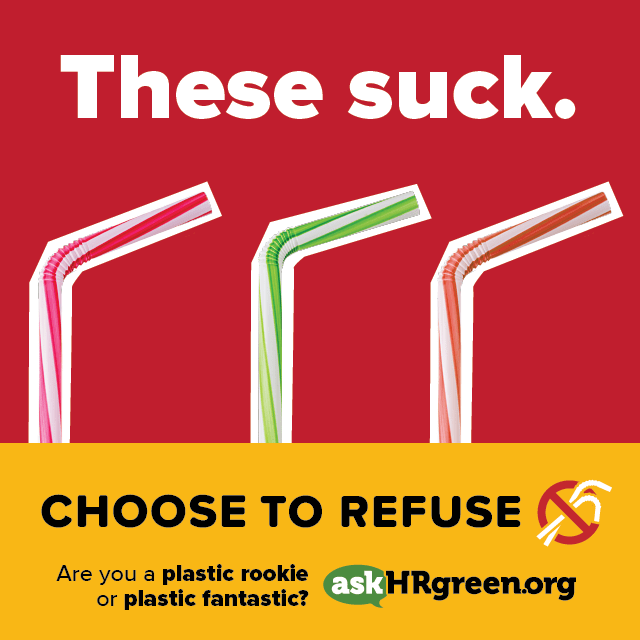 Together with Keep It Beachy Clean we are asking local restaurants to sign up online at www.keepitbeachyclean.org/strawfree and pledge to distribute straws only upon request on April 22. In return, we will provide each participating restaurant with window clings, tabletop signs, menu cards, children’s place mats, and social media graphics to support their commitment to sustainability. Participating dining establishments will also be featured on the websites and social media pages of both organizations. Straws do have their place and some patrons depend on straws due to disabilities or health conditions that make drinking from a cup difficult. That’s OK and there’s still something you can do to be more sustainable! Each participating restaurant will be supplied with a sample of paper straws to offer to their guests who must have a straw. While paper straws are a better alternative to plastic, the best alternative for restaurants is to adopt a “straws-on-request” policy. 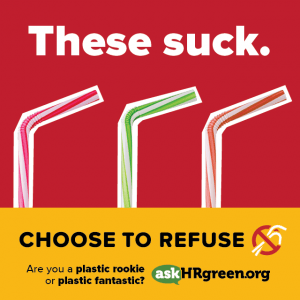 This Straw-free Earth Day campaign is a natural fit with our recent Choose to Refuse Single-use Plastics campaign. Saying ‘no’ to plastic straws, utensils, grocery bags, coffee stirrers and polystyrene to-go containers may be the single most important thing you can do for the environment. It reduces not only the amount of waste we create, but also the amount of natural resources we use and pollution we create producing and transporting products across the county. Using fewer disposable products is a no-brainer for sustainability. The Straw-free Earth Day campaign also includes an online pledge individuals can complete to add their support to this effort. In addition to skipping the straw, the pledge recommends other tips such as letting servers know you don’t want a straw or bringing your own reusable straw when on the go. About Keep It Beachy Clean Keep It Beachy Clean is a program of Clean Virginia Waterways of Longwood University. The Virginia Beach Resort Advisory Commission’s G.R.E.E.N. Committee serves as the advisory committee to the Keep It Beachy Clean Program. See a list of our 2018 sponsors, partners and participants. Please help support Keep It Beachy Clean by donating to Clean Virginia Waterways here. Find Keep It Beachy Clean on Facebook Twitter and Instagram for all the latest updates on Straw-free Earth Day!